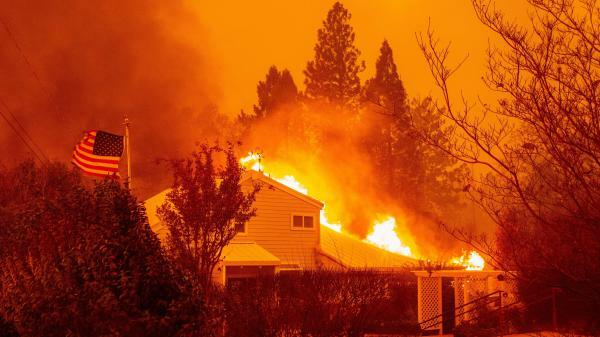 A home burns during the Camp Fire in Paradise, Calif., in November 2018. It was one of several fires often discussed in terms of the changing climate. A new survey shows a jump in the number of Americans who are "very worried" about global warming. There has also been an 8-percent rise in the number of Americans who are "very worried" about global warming – 29 percent said they feel that way, while 40 percent said they are "somewhat worried." 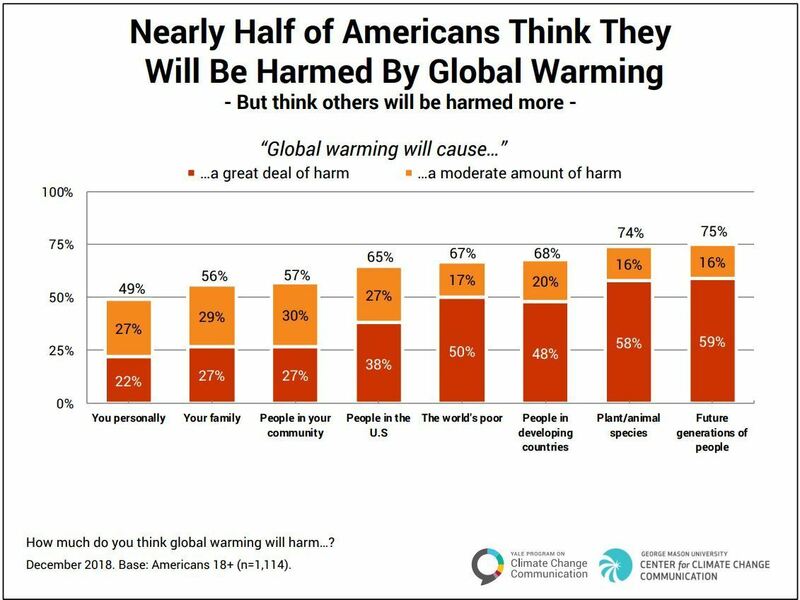 And 56 percent of Americans said their family will be harmed by global warming. 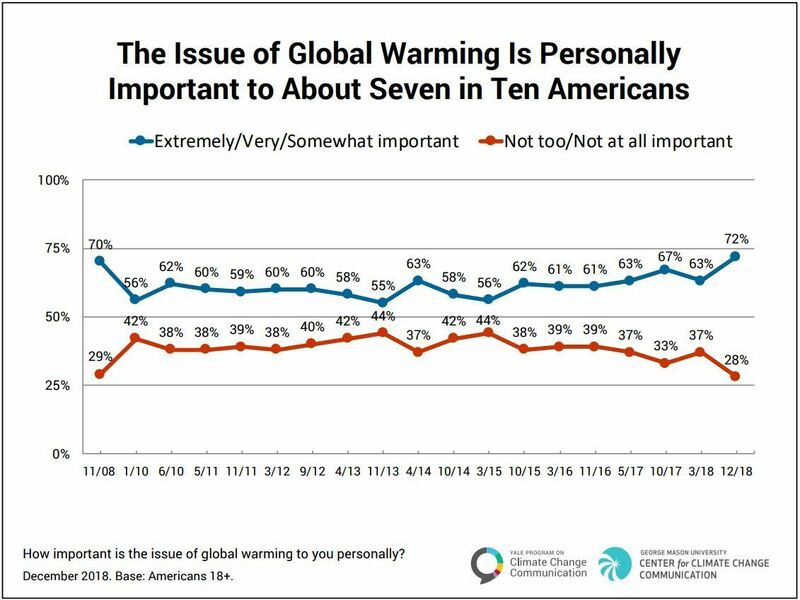 In 2018, more people surveyed said they felt the issues of global warming was personally important to them than at any time in the survey's 11 year history. "Americans have, unfortunately, had far more experience with what climate change looks like," researcher Anthony Leiserowitz told NPR. He led the team behind the survey, "Climate Change in the American Mind," which was a collaboration between Yale and George Mason Universities. He said the biggest surprise for researchers was how Americans' worry about global warming spiked between their surveys in March and December of last year. "It really does indicate that Americans are increasingly seeing this not as a distant problem, but as something that's here and now," Leiserowitz said. While scientists often can't tie specific weather events to climate change, global warming is leading to warmer oceans and hotter summers – the kinds of conditions that exacerbate the high-profile storms and fires that are impacting the U.S.
A major federal government climate assessment released in November painted a stark picture of the costs and dangers the country faces as global temperatures continue to climb: From billions of dollars in infrastructure damage and disaster response funds, to the spread of disease and rising seas. Fifty-four percent of Americans said they haven't yet felt the effects of global warming, but that number is at its lowest level in a decade. Results from the research group's findings in a survey conducted last November and December. The survey, released Tuesday, also took stock of how Americans see the role of humans in global climate change. Sixty-two percent of those surveyed said global warming is mostly caused by humans – which is what science has shown. Twenty-three percent of Americans said it is "mostly caused by natural changes in the environment," the lowest number of people to say so since the survey began in 2008. Leiserowitz said he thinks the survey also shows the impact of media coverage on public impressions of climate change. "The only way most Americans even know about these issues is because of coverage," Leiserowitz explained. "So when the media does not report this, it is literally out of sight, out of mind. But when the media does report it, it becomes salient." The presence of climate change in public debate – and in Americans' consciousness – has both grown and faded over the years. A look back at Leiserowitz's data from the last decade shows that Americans' concern about the issue has only recently matched or surpassed public opinion in 2008. Leiserowitz explained that a combination of media (Al Gore's climate change documentary An Inconvenient Truth and the climate change disaster film The Day After Tomorrow) and politics (John McCain was vocal about the threats of global warming) drove increased levels of awareness and concern about the problem at that time. He said their research shows the subsequent rise of the conservative tea party – which sidelined concerns about climate change — erased those gains. The survey says that 48 percent of Americans feel hopeful about global warming, while 51 percent feel helpless. Just 14 percent of Americans think it is too late to do anything about it.